Harris Farm milk is available year-round at our farm store in Dayton and at Saco Farmers' Market from May through October. 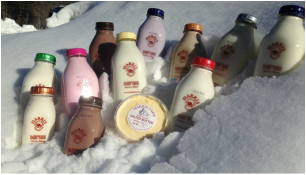 Look for our glass-bottled milk at your favorite store in Southern Maine! If they don't carry it, request it! Visit our farm store in Dayton for all of our milk products, our own homemade butter, pasture-raised beef, local eggs, and much more! !